i have a friend who used single status at work and got secret marriage with his bf. at nagbreak sila ..afterwhich she found out that their marriage was registered at NSO. ang tanong ko po" pag nalaman po ba ng company ang tungkol sa marriage niya, pwede ba siyang matanggal dahil dun?" until now, hindi niya pa pinabago status niya kasi never silang nagsama nung guy at may sarili sarili na silang buhay. ano po ang pwede niyang gawin para di matanggal sa work, bread winner po kasi siya sa knilang pamilya. If your friend is being pressured at work, she can ask for help from the Department of Labor’s PACU (Public Assistance and Complaints Unit) in Intramuros, Manila. The PACU might also be located in the DOLE regional offices. Based on the provisions of the Labor Code and Republic Act 9710 “Magna Carta For Women”, I don’t think there is a ground for the company to terminate your friend’s employment. But can the company forced her to use the surname of that guy and change her status to married? Unfortunately, may nakaalam po at isinumbong siya kailan lang sa management, she was waiting for the memo. pero, sa ngayon nakakranas daw po siya ng verbal harrassment from the assistant manager in hrd. 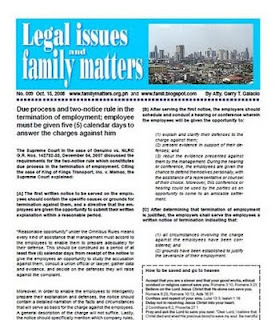 ano po ang nilalaman ng "RA9710 ng labor code at ano po ang nakapaloob sa magna carta for women? how it will protect my friend. Why are you the one who seems more interested in this case? Why isn’t your friend the one asking me these questions? Like I said, tell your friend to seek help from the PACU. I do not know if the number is still current but try 527-8000.
ako po ang friend niya na may problem. maraming salamat po sa payo at tulong ninyo. sana po marami pa kayong matulungan. Lalo na po dun sa mga lubos na nangangailangan.